Add elegance and grace to your knitting projects with Interweaves Favorites. These designs are modern and sophisticated. This book offers a large range of knitting techniques and styles to explore them in. A must buy Product. Discover traditional northern European knitting techniques to create modern garments. Lucinda Guy follows up her recent successes with another exploration of northern European knitting, this time expanding to include Nordic, Baltic, and Scandinavian heritage knitting traditions. This latest collection includes full-sized garments as well as accessories for women, men, children, and home and contains 20 pieces total. 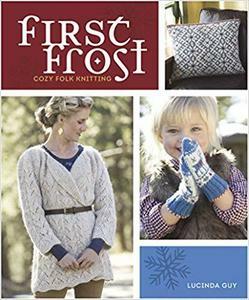 First Frost: Cozy Folk Knitting celebrates all that is wonderful about decorative folk knitting. As essential everyday wear for anyone living and working in the harsh, cold climates of the North, folk knits could range from the simple and utilitarian to textural, braided, tasseled, and exuberantly colored and patterned knits reserved only for special occasions and celebrations. Lucinda turns historic knitting traditions into everyday wear that is folk-inspired but never costumey and brings heritage knitting techniques to a modern audience.